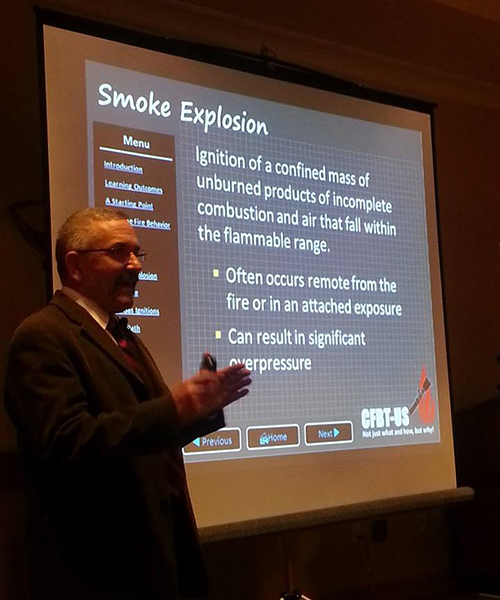 It has been a busy six weeks since my last post with several trips to Chile and around the United States delivering seminars on Practical Fire Dynamics and Reading the Fire along with finalizing the fire district’s budget for 2014. Spending a full-day on B-SAHF and reading the fire at the Springfield Professional Firefighters IAFF Local 333 professional development seminar and working with our fire district’s members on our adaptation of First Due Questions (see FDQ on Facebook and First Due Tactics on the web) provided inspiration to get back to the Reading the Fire series of blog posts. 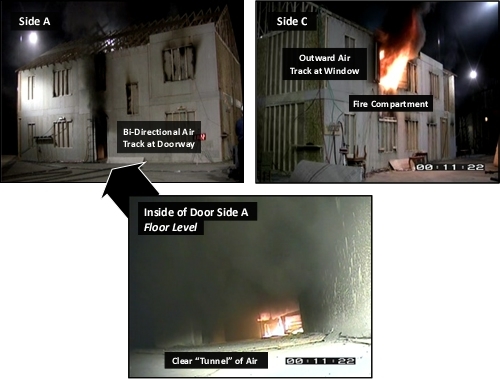 Fireground photos and video can be used to aid in developing and maintaining proficiency in reading the Fire using the B-SAHF (Building, Smoke, Air Track, Heat, and Flame) organizing scheme for fire behavior indicators. This post provides an opportunity to exercise your skills using a video segment shot during a live fire training. 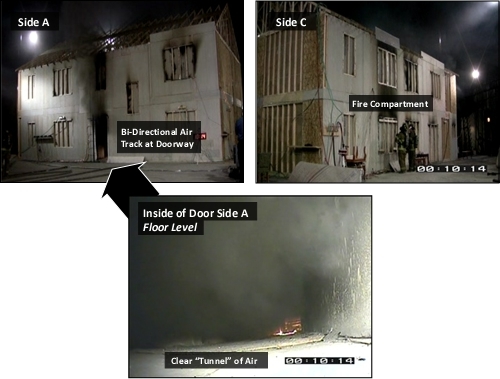 While live fire training is a considerably different context than an actual incident, this video provides an opportunity to focus on each of the elements of B-SAHF somewhat more closely than in typical incident video. In this exercise, the focus will be on identifying specific indicators related to stages of fire development and burning regime (rather than anticipating fire development). 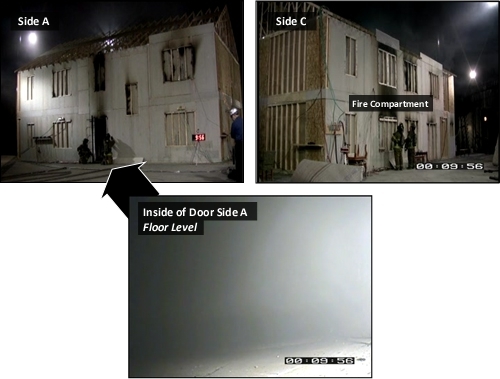 In this video, the fire has been ignited in a room (likely a bedroom) on the Bravo/Charlie corner of the building and the video is being taken from the exterior on the same corner. 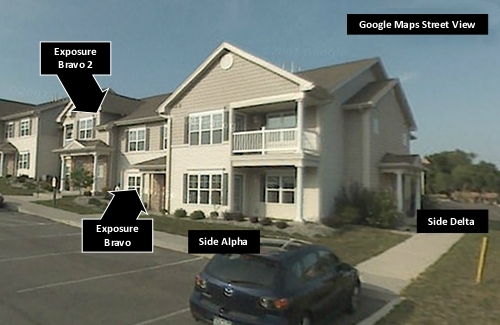 The ventilation profile is uncertain, but there is likely an opening/entry point on Side Alpha. As you watch the first 0:43 of the video, identify the B-SAHF (Building, Smoke, Air Track, Heat, and Flame) indicators that can be observed and how they change over time. What are the first visible indicators? What indicators are visible on and through the window between 0:43 and 0:56? 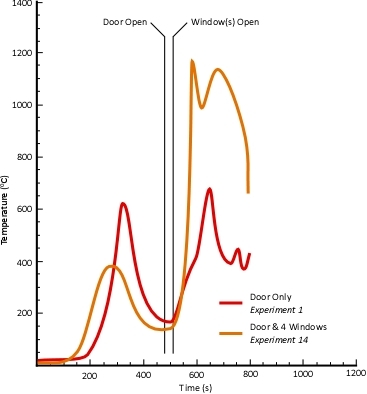 How do condensation of water or pyrolysis products on window glazing aid in determining burning regime and stages of fire development? How might these indicators differ at locations more remote from the fire? How do the B-SAHF indicators change between 0:56 and 2:40? Why might this be the case? After 2:40 flaming combustion appears to increase. What might have influenced this change? 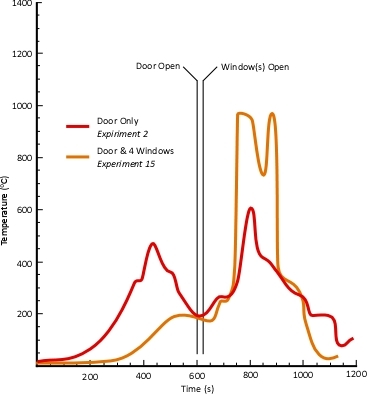 By 3:37, the window on the Bravo/Charlie corner is dark and little flaming combustion can be observed. What might this indicate about burning regime and stages of fire development? At approximately 3:41, how do smoke and air track indicators change. What might this indicate? 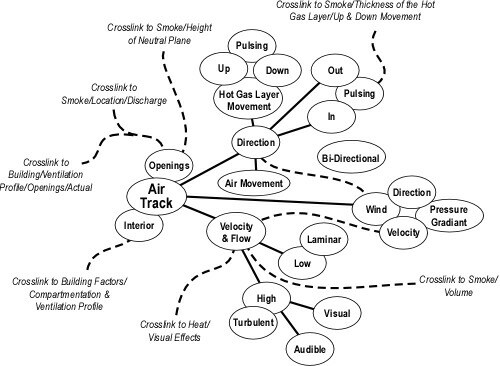 If there is no change in ventilation profile, how might the smoke and air track indicators change next? At 4:10 crews on Side Alpha report fire in a front (Side Alpha) room. 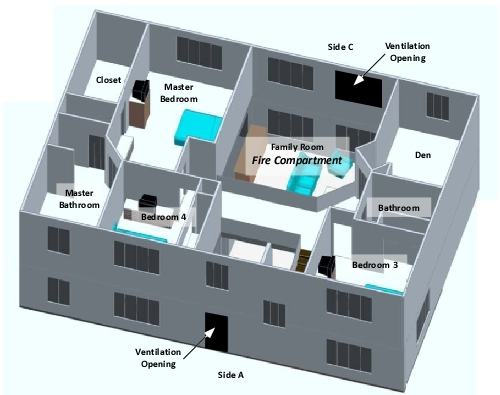 Why might fire conditions be significantly different on this side of the building than in the original fire compartment? 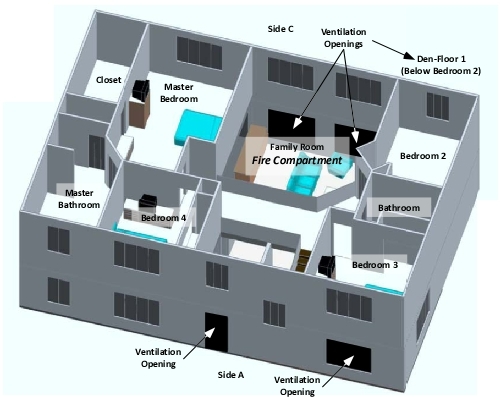 How might extinguishment of the fire in a room on Side Alpha influence fire development in the original fire compartment (Bravo/Charlie corner)? The lower portion of a window in the fire compartment on the Bravo/Charlie corner is broken out at 4:24. How does this change the B-SAHF indicators observed from this location? What may be inferred from these observations? Immediately after the lower portion of the window is broken out, a narrow fog stream is applied in a rotating manner through the window. 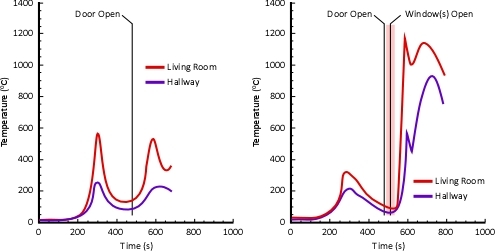 What effect does this have on fire conditions in the room? 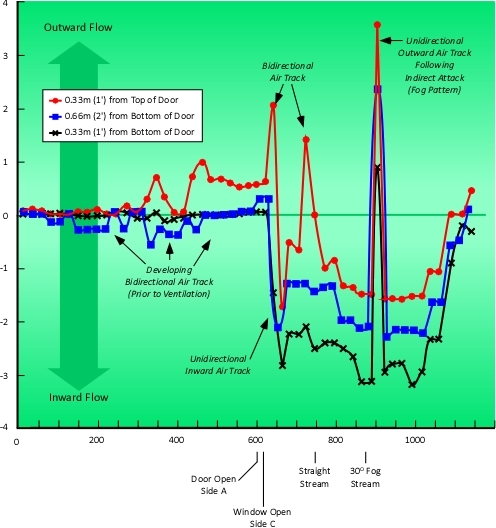 How did smoke and air track indicators change during the brief water application? What did these changes indicate? How did smoke and air track indicators change after the brief application of water into the fire compartment? After the brief application of water through the window, how long did it take for the fire to resume significant growth in the fire compartment (crews operating from Side Alpha delayed fire attack intentionally). At 7:09, the upper portion of the window on the Bravo/Charlie corner is removed. 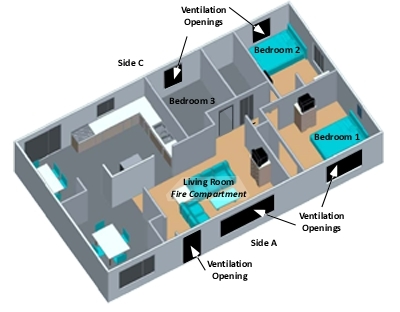 How does this change in ventilation influence visible B-SAHF indicators and fire behavior? How do the B-SAHF indicators change as interior crews begin fire attack? How might taking the glass in the window(s) on the Charlie side of the building have influenced visible B-SAHF indicators and fire behavior? 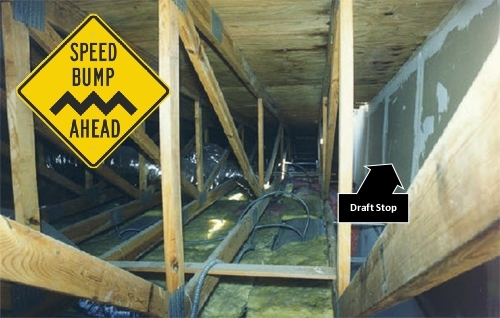 Had the window in the fire compartment located on Side Charlie (Charlie/Bravo Corner) failed first, what impact would this have had on flow path? How might this have influenced conditions encountered by the fire attack crew entering from Side Alpha? 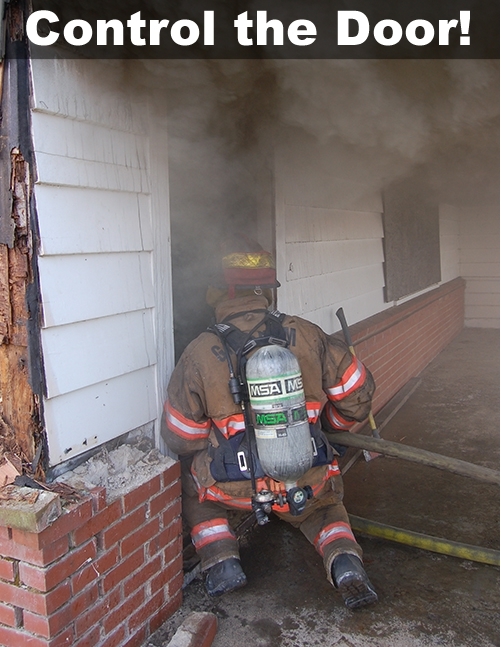 At approximately 8:40, interior crews begin hydraulic (negative pressure) ventilation through a window in the fire compartment on the Charlie/Bravo corner. How does this tactic integrate with the natural pressure differences created by the wind? What might be a more effective alternative? Developing world class knowledge and skill takes approximately 10,000 hours of deliberate practice. This equates to almost three hours every day, 365 days per year, for 10 years. If you only practice every third day achieving 10,000 hours in 10 years would require just over eight hours per day and if you only spend 2 hours every third day, it would take over 40 hours to achieve 10,000 hours of deliberate practice. How are you coming on your 10,000 hours? Keep at it! 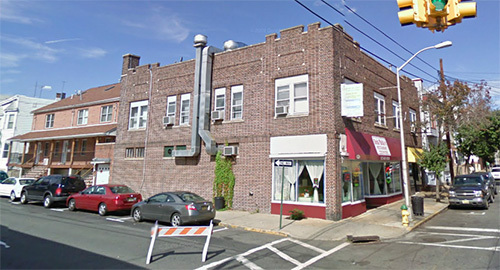 On March 10, 2013 five Harrison, New Jersey firefighters were injured in an explosion while working at a commercial fire at 600-602 Frank E. Rodgers Boulevard. The fire originated in a two-story commercial building at the corner of Frank E. Rodgers Boulevard North and Davis Street and extended into Exposures Charlie and Delta, two-story residential buildings. Image from Google Maps, click on the link to walk around using Street View. Before watching the video (or watching it again if you have already seen it), download and print the B-SAHF Worksheet. 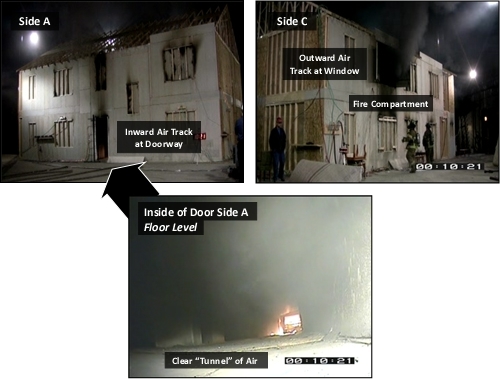 Using the pre-fire photo (figure 1) and observations during the video, identify key B-SHAF indicators that may have pointed to potential for extreme fire behavior in this incident. Important! Keep in mind that there is a significant difference between focusing on the B-SAHF indicators in this context and observing them on the fireground. Here you know that an explosion will occur, so we have primed the pump so you can focus (and are not distracted by other activity). 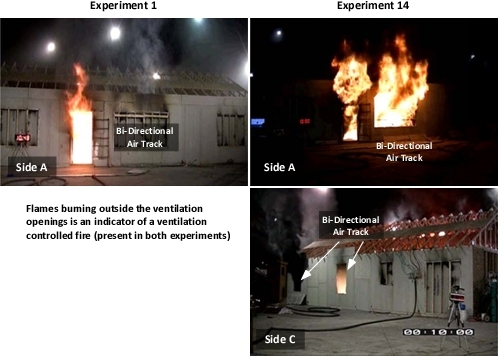 While smoke explosion and backdraft are often confused, there are fairly straightforward differences between these two extreme fire behavior phenomena. 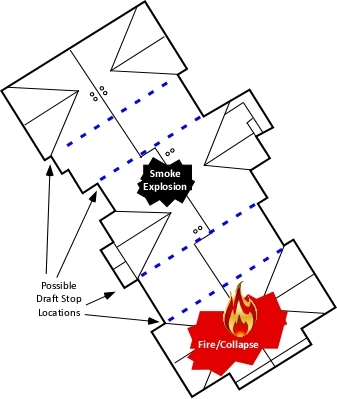 A smoke explosion involves ignition of pre-mixed fuel (smoke) and air that is within its flammable range and does not require mixing with air (increased ventilation) for ignition and deflagration. A backdraft on the other hand, requires a higher concentration of fuel that requires mixing with air (increased ventilation) in order for it to ignite and deflagration to occur. 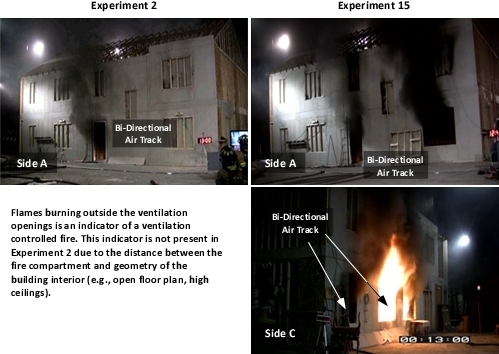 While the explanation is simple, it may be considerably more difficult to differentiate these two phenomena on the fireground as both involve explosive combustion. Did you observe any indicators of potential backdraft prior to the explosion? Do you think that this was a backdraft? What leads you to the conclusion that this was or was not a backdraft? If you do not think this was a backdraft, what might have been the cause of the explosion? I would like to say thanks to all of you who have sent e-mail or contacted me on Facebook inquiring about the status of the CFBT-US blog. The last several years have been extremely busy at Central Whidbey Island Fire & Rescue and my focus has been almost exclusively on the fire district. However, I am renewing my commitment to developing knowledge of practical fire dynamics throughout the fire service and will endeavor to return to posting on a regular basis. 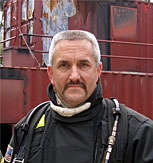 In addition, I am working on a series of short (10-minute) drills on fire dynamics that will be cross posted on the CFBT Blog and the Fire Training Toolbox. 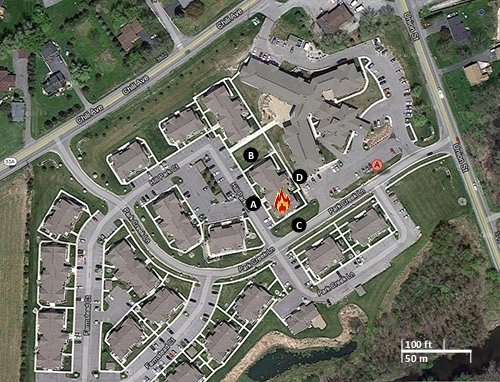 This post examines fire development during a residential fire in Lyons, New York. Watch the first minute and thirty seconds (1:30) of the video. 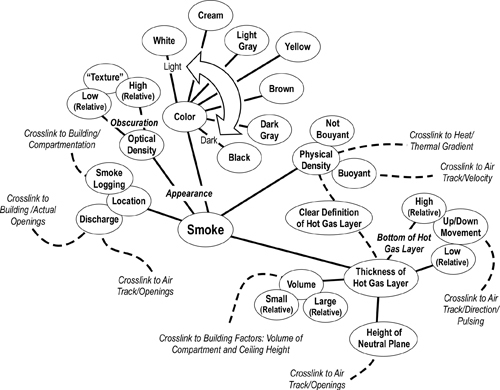 First, describe what you observe in terms of the Building, Smoke, Air Track, Heat, and Flame Indicators; then answer the following five standard questions? What indications of fire stream effectiveness did you observe? 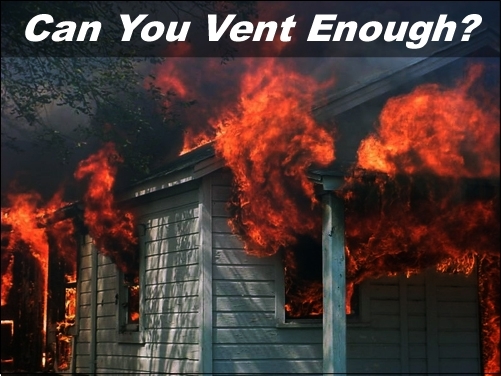 What potential avenues of fire extension would you consider based on the type of construction and building design? As you watch the remainder of the video, consider the changes in observed conditions and what information this might provide the Incident Commander. What information should interior crews report to Command during this stage of incident operations.